Food Recovery Network (FRN) is growing and this growth comes in many forms: from student-led research, targeted outreach campaigns towards colleges without an FRN chapter, to events such as student-organized Regional Summits. California State University at Dominguez Hills (CSU, Dominguez Hills) is an example of growth from student-driven outreach. Hawk McFadzen, the CalFresh Outreach Coordinator at CSU, Dominguez Hills, attended the LA County Regional Summit in Spring 2018. The Regional Summits are an opportunity to learn about food recovery and connect with people in the campus community who are also interested in food waste and sustainability. After meeting FRN’s Program Manager, Hannah Cather (known as, hc), at the Regional Summit, Hawk submitted an application to join the Network and soon committed to the Chapter in Progress (CHIP) process. The CHIP process consists of seven steps students must complete in order to become an Official FRN Chapter. Being a CHIP is an exciting time; students work with their peers, campus dining, and outside restaurants to recover surplus food. They also communicate with a hunger-fighting nonprofit partner in the community, who will receive the donated food. It is a process that builds leaders on a college campus. Establishing a chapter gives students the opportunity to connect with external partners in order to make food recovery happen. Students will work with dining managers on campus to sort out the logistics of doing a recovery; they will coordinate the details of the recovery with their team, and they will continue to keep FRN National in the loop on their continued progress with the program. Hawk committed to the CHIP process because they noticed high levels of food insecurity on their campus. 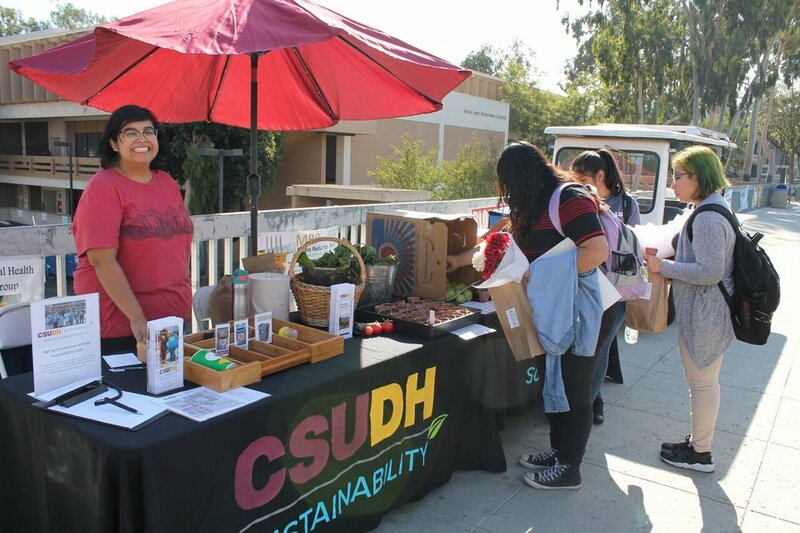 CSU, Dominguez Hills is one of the many chapters in our Network that donate their surplus food to an on-campus food pantry. For one of their first recoveries, they participated in the CalFresh Outreach Day. CalFresh is federally known as the Supplemental Nutrition Assistance Program or SNAP. The outreach day strives to connect low-income students with farmers markets that accept their SNAP benefits, giving them access to fresh, local produce. Food Recovery Network is a budding movement and in some cases, growth is done with the help of FRNds. During the Spring, leaders from chapters across the country have the opportunity to host a Regional Summit. These Summits are one-day conferences that bring FRNds, food waste warriors, and those curious about the movement together for a day of learning and networking. The summits are put on by Regional Outreach Coordinators (ROCs). They are student leaders who work with hc to coordinate, facilitate, and promote their conference within their community. In the Spring of 2018, with the funding of the Annenberg Foundation, FRN supported two ROCs in the five-county Los Angeles area. Frida Edninjok, Former President and founder at California State University, Northridge FRN and Elise Froebe, FRN Vice President at Pepperdine University, served as ROCs for the LA Summit. One of the goals of the Regional Summits is to inspire and connect the Network at a smaller scale than the National Food Recovery Dialogue – a multi-day conference that intends not only to bring the entire Network and experts in the hunger and food waste spheres together, but also to welcome new, interested people to the food recovery scene. The ROCs work with hc and other FRN National staff to connect with people in their communities as well as FRN chapter members in their area. In the same way, Hawk from Dominguez Hills attended the Summit at CSU, Northridge, students from other universities have an opportunity to learn about FRN at Regional Summits this Spring and hopefully, they will be inspired to start a chapter on their campus. With the support of organizations like the Annenberg Foundation and the Claneil Foundation, FRN has the capacity to host ROC Summits across the country and spread the word about food recovery in higher education. Currently, food recovery is not the norm on college campuses in the United States, but through Regional Summits, FRN hopes to change that narrative. The summits are an organic form of outreach for FRN because it is for Chapters in the Network and folks interested in joining FRN’s movement. The most important way the Network grows is through the help of FRNds. Students who have applied to be part of the Network after hearing from other chapter leaders have gone on to be strong and dedicated chapter leaders themselves. There is nothing like a friend sharing their experience that sparks the interest of someone new. It is safe to say Summit seeds, plant CHIP trees. If your school does not have an FRN Chapter and you would like to change that, submit a New Chapter Application! If you are interested in the Regional Summits this Spring, check out our website for more information.